Pope Francis addresses a joint meeting of Congress on Capitol Hill in Washington, Sept. 24, 2015, making history as the first pontiff to do so. "A political society endures when it seeks, as a vocation, to satisfy common needs by stimulating the growth of all its members, especially those in situations of greater vulnerability or risk. Legislative activity is always based on care for the people," Francis said, in the first papal address in Congress' history. The pope touched on several sensitive issues during his 50-minute speech, including the refugee crisis in the Middle East and Europe, the urgent need to coordinate global action to control climate change, and the excesses of capitalism and materialism. He paused several times as waves of applause interrupted his reading, but observers in the chamber saw that not everyone joined the enthusiastic display. Partisan divides among members of Congress — between liberals and conservatives, between Democrats and Republicans — were reflected in their response to different parts of the pope's message. 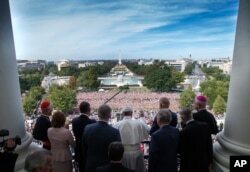 After his speech, the pope appeared on a balcony of the Capitol, with leaders of both main political parties beside him, and greeted the crowd — a tightly packed sea of faces stretching several hundred meters from the historic building. The Argentine-born pontiff asked for God's blessing for all the children present, thanked everyone for welcoming him and then ended his prayerful remarks with "God bless America," which brought boisterous cheers. Tens of thousands of people watched the proceedings from the Capitol lawn on Jumbotron screens. Hundreds more were gathered inside the packed House of Representatives chamber, including Cabinet members, Supreme Court justices and lawmakers' special guests. The pope, speaking slowly and carefully in accented English, paused several times as waves of applause interrupted his reading, but observers in the chamber noted that not everyone joined the enthusiastic display. The Argentine-born church leader began by telling the lawmakers he was speaking through them to the American people – "the many thousands of men and women who strive each day to do an honest day’s work, to bring home their daily bread, to save money and, one step at a time, to build a better life for their families." Pope Francis addresses a joint meeting of the U.S. Congress in the House Chamber on Capitol Hill in Washington, Sept. 24, 2015. "These are men and women who are not concerned simply with paying their taxes, but in their own quiet way sustain the life of society," Francis said. "They generate solidarity by their actions, and they create organizations which offer a helping hand to those most in need." He also reminded the lawmakers of the United States’ immigrant roots and warned against hostility to or harsh treatment of newcomers. “We must not be taken aback by their numbers, but rather view them as persons, seeing their faces and listening to their stories, trying to respond as best we can to their situation. To respond in a way which is always humane, just and fraternal,” Pope Francis said. That comment, which referenced the Syrian refugee crisis, drew the largest applause from the crowd on the lawn. The pope, who is scheduled to visit a Philadelphia correctional facility on Sunday, reiterated the church’s support for the sanctity of human life and the end of the death penalty. But Francis also encouraged lawmakers to allow a convicted lawbreaker the chance to reform and the hope of release. The pope said he sees the United States as a nation whose people are inspired by the memories and values embodied in four famous Americans – former president Abraham Lincoln; the assassinated civil-rights leader Martin Luther King Jr.; Dorothy Day, a 20th-century Catholic social advocate who worked with the poor; and Thomas Merton, a Trappist monk who wrote extensively on spiritual issues. 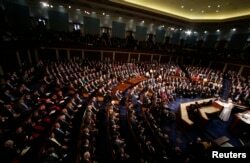 Anticipation for the pope’s address had reached a fever pitch by early Thursday. And no one was more excited than the man who invited him, devout Catholic and House Speaker John Boehner. Boehner, a former altar boy, has dismissed concerns that the politically engaged Francis will stir the controversies of the day. "The pope transcends all of this," he said. "He appeals to our better angels and brings us back to our daily obligations. The best thing we can all do is listen, open our hearts to his message and reflect on his example." Pope Francis, accompanied by members of Congress, waves to the crowd from the Speakers Balcony on Capitol Hill in Washington, Sept. 24, 2015, after addressing a joint meeting of Congress inside. Republican Representative Paul Gosar of Arizona said he would boycott the speech because of the pope’s focus on what Gosar calls the “fool’s errand” of climate change. On the Democratic side, Representative Luis Gutierrez of Illinois contrasted the compassion of Pope Francis for migrants with the harsh anti-immigrant rhetoric of leading Republican presidential candidate Donald Trump. Speaker of the House John Boehner, R-Ohio (R) meets Pope Francis in the U.S. Capitol building as the Pope arrives to deliver his speech to a joint meeting of Congress in Washington D.C., Sept. 24, 2015. ​"Frankly the majority of Americans of all faiths and political stripes across the nation – are very much looking forward to the pope’s visit and the pope’s words because our nation needs a counterbalance, a counterweight to what has become the ugliest, most xenophobic, most anti-immigration campaign in anyone’s memory," he said. The speech brought immediate reaction. Senator Ted Cruz, who is also a 2016 Republican presidential candidate, said he welcomed “the pope’s call to put aside petty bickering and come together behind shared values to address the challenges facing us all." "We should show compassion to people across the globe. ... We should welcome, we should celebrate legal immigrants ... (that) is entirely consistent with the rule of law and securing the border. We should know who is coming to this country. When we speak of welcoming immigrants, I believe that should refer to legal immigrants," Cruz added. Congressional staffers and guests strain to view and photograph the departure of Pope Francis in his Fiat 500L, on Capitol Hill in Washington after his speech before a joint meeting of Congress, Sept. 24, 2015. Sanders has spoken extensively on the campaign trail about income inequality in the U.S.
Republican Senator Bill Cassidy of Louisiana took the pope to task over his stance on climate change and reducing carbon emissions. “We can shut down carbon and go back to the Stone Age, and the world is far worse. … I live in a state [Louisiana] where your average blue-collar worker’s pathway to prosperity is working on off-shore oil rigs or working on a petro-chemical plant," Cassidy said. "If we destroy those jobs, those people – those wonderful families that he [the pope] spoke of – their future is markedly diminished." Pope Francis waves from the Speaker's Balcony after concluding his addresses before a joint meeting of the U.S. Congress, Sept. 24, 2015. Democratic Senator Jon Tester of Montana said he was "very touched by the guy." "It was an amazing speech that, hopefully, will help heal. I stood up and applauded a lot: families, the middle class, immigration, climate change – these are not things that are going to go away unless we are proactive about it and help lead the world in a proper direction," Tester said. After his address, Pope Francis briefly stepped out onto a Capitol balcony and waved to the cheering crowd on the West Front. Speaking in Spanish, he said, "I'm so grateful for your presence. The most important ones here, children. I'll ask God to bless them." 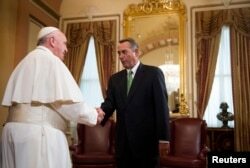 House Speaker Boehner became emotional during the pope’s brief comments and used a handkerchief to dab at his eyes. Francis ended his remarks in English, saying "Thank you very much and God bless America," which brought boisterous cheers from the crowd below. After leaving the Capitol, Francis spoke to roughly 400 people at St. Patrick's Church in downtown Washington, addressing parishioners, people served by Catholic Charities and choirs from two local high schools. Pope Francis greets parishioners, immigrants and clients of Catholic Charities, as he arrives at St. Patrick's Church, in Washington, Sept. 24, 2015. Afterward, the pontiff was going to help serve lunch to homeless people who are regularly fed by Catholic Charities. Pope Francis departed late Thursday afternoon from Washington to fly to New York. The pope is traveling to New York City, where he will celebrate an evening prayer service at St. Patrick's Cathedral. VOA's William Gallo, Cindy Saine, Michael Bowman, Mia Bush and Carol Guensburg contributed to this report. Some information for this report came from AP. VOA Covers Pope Francis' Visit to U.S.
Will Francis Alter Roles, Rules Affecting Catholic Women?